Smiths Medical today announced the U.S. commercial launch of Delta Med SpA’s DeltaVen® Closed System Catheter and the Food and Drug Administration (FDA) clearance. 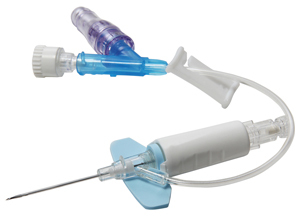 DeltaVen® is the next advancement in Peripheral IV Catheters (PIVC); offering the needle, extension tubing, and an option for a needleless connecter in an “all in one” catheter. DeltaVen® will be available immediately in a wide variety of sizes and configurations to meet patients’ needs, including the only 26 gauge safety catheter in the U.S. market. “We are pleased to expand Smiths Medical’s portfolio with the DeltaVen® Closed System Catheter and provide customers great options to successfully treat their patients,” said Chris Holmes, President and CEO at Smiths Medical. The DeltaVen® Closed System Catheter allows physicians to feel the insertion of a closed system catheter with easy threading and see the full range of configurations and gauge sizes to meet their needs. DeltaVen® is manufactured by Delta Med SpA, distributed by Smiths Medical.